Let’s say a bee lands on your hand. A message from the nerves in your hand races to your brain –“There’s a bee on my hand.” Your brain quickly processes the information and responds with the message, “Danger. Move your hand. The bee might sting you.” You shake your hand and the bee flies away. Crisis averted. The nervous system and its main parts. All of this happens in less than two seconds. In fact, messages from your body can zip to your brain at a speed of 200 mph. Your nervous system is the communications center for your body. Your brain is the central control panel. Here, billions of neurons receive electrical impulses from nerves in your body. The nerves can alert your brain to danger or pain. Your central nervous system includes your brain and your spinal cord. Your spinal cord is a long bundle of neurons that goes down your back. From the spinal cord, nerves stretch throughout your body like a highway. This is the peripheral nervous system. If you touch a hot stove, impulses from your brain go to your brain. Your brain sends back a message telling you to move your hand so you don’t get hurt. The hypothalamus controls body temperature, thirst and other bodily functions. If you get too cold, your brain sends a message to your body to shiver, which helps warm you up. Your hypothalamus even controls when you get a fever. When germs invade your body, chemical messages are sent to the brain. Your brain tells white blood cells to start working harder to fight off the bacteria. This extra work makes your body warm up. A fever means the white blood cells are defending your body from the invaders. All about your nerves and how your nervous system reacts to danger. The hypothalamus controls body temperature, thirst and other bodily functions. A video about the human nervous system and how it functions. Question: How big is the nervous system? Answer: Your brain weighs about 3 pounds. 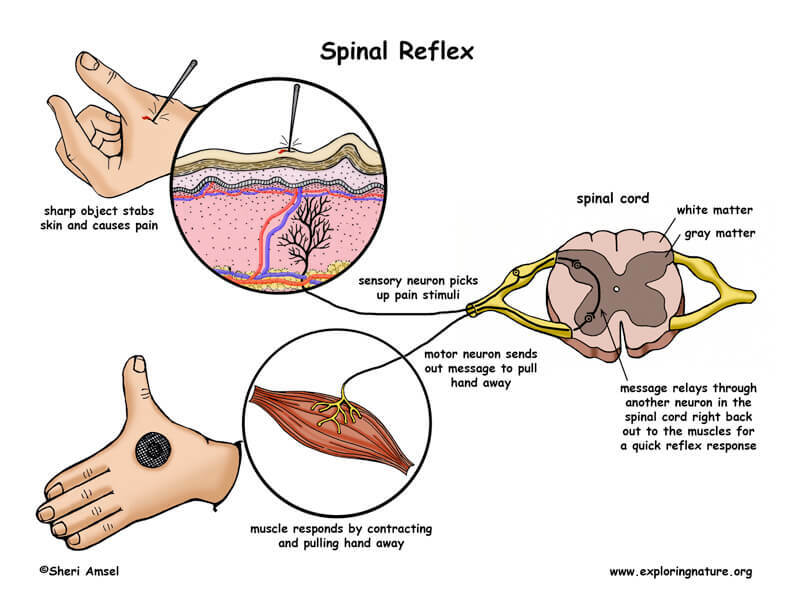 The spinal cord is 18 inches long and is about ¾ inch thick. Nerves run throughout your body. Question: Can my nervous system be damaged? Answer: Your brain and spinal cord are protected by bone, fluid and special membranes. But, they can be permanently damaged by accidents or illness. Always wear a helmet when you’re riding a bike or skateboarding and wear a seatbelt in the car. These things can help keep your precious control panel safe. Enjoyed the Easy Science for Kids Website all about Your Nerves info? 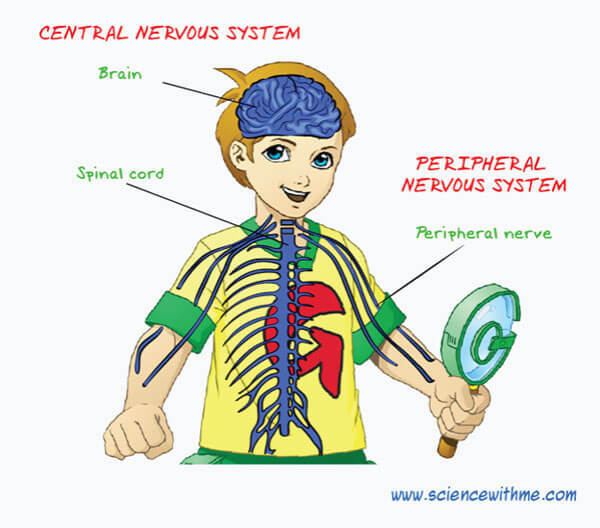 Take the FREE & fun all about Your Nerves quiz and download FREE Nerves worksheet for kids. For lengthy info click here.